When Dallas resident Callie Taylor died young, she expected to go to Heaven, or maybe Hell. Instead, when she met her fate early thanks to a creep with a knife and a mommy complex, she went to Alabama. Now she's witnessed another murder, and she's not about to let this one go. She's determined to help solve it before an innocent man goes to prison. And to answer the biggest question of all: why the hell did she wake up dead in Alabama? As Molly straightened up, the man slipped the wire over her head and twisted it around her neck. She struggled, but he pulled the garrote tighter and tighter. I was screaming at the top of my ghostly voice, for all the good it did me. I moved up behind the man and beat at his back with closed fists--fists that slipped in and out of his back without ever making real contact. He shuddered a little--clearly he was one of the very slightly sensitive ones--but he didn’t loosen his hands. I reached up and tried to grab the wire, tried to pull against the pressure he was exerting on the wire and it did loosen for an instant. But only for an instant. The living have more control over solid objects than the dead do. I never resented that fact more than at that moment. But I kept trying. I kept trying as Molly’s face turned purple, then blue, then black, kept trying even as she drooped in the man’s grip. Then he loosened the wire and it was too late. I watched that wispy, light-on-fog life force slip out of Molly and move on to wherever it is that other people go when they die. I was glad she didn’t show up next to me as a full-blown ghost. At that moment, I wouldn’t have wished my impotent half-existence on anyone. I couldn’t help thinking that if I’d been alive, I might have been able to save her. If I could have cried real tears, I would have. As it was, I was sobbing hoarsely and calling the man every dirty name I could think of. I was still cursing as I followed him around the kitchen. First he opened the pantry and pulled out a box of Hefty garbage bags. Then he grabbed a knife out of the block on the counter. And finally, he picked up Molly’s body and carried it to the bathroom. Margo Bond Collins lives in Texas with her husband, their daughter, several spoiled cats, and a ridiculous turtle. She teaches college-level English courses online, though writing fiction is her first love. She enjoys reading urban fantasy and paranormal fiction of any genre and spends most of her free time daydreaming about vampires, ghosts, zombies, werewolves, and other monsters. 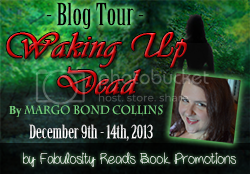 Waking Up Dead is her first published novel. Her second novel, Legally Undead, is an urban fantasy, forthcoming in 2014 from World Weaver Press.